Dale E. Schroeder, 87 of Beatrice passed away at the Beatrice Community Hospital on Thursday, November 22, 2018. He was born on August 23, 1931 at Beatrice to Edwin H. and Martha L. (Siems) Schroeder. Dale was a 1948 graduate of Beatrice High School. After graduation he farmed his entire life until retiring in 2015. Dale married Dorothy Frerichs on June 7, 1959 at St. John Lutheran Church of Beatrice and to this union brought three sons. 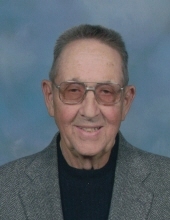 Dale was a member of St. Paul’s (Soap Creek) Lutheran Church of rural DeWitt where he served as a church elder and was involved in the church council and church choir. He was also a member of the Blue Valley Pork Producers where he enjoyed cooking at the Gage County Fair each year. He collected antiques and antique tractors. Dale also enjoyed going to auctions and attending his grandchildren’s activities. Dale was taught to write with his right hand even though activities like bowling and pitching he used his left hand. Survivors include his loving wife of 59 years, Dorothy of Beatrice; three sons, Kenton (Patricia) Schroeder of DeWitt, Kurtis (Connie) Schroeder of Hickman, Kory (Jennifer) Schroeder of Raleigh, North Carolina; grandchildren, Ethan Schroeder and special friend Makalah Kubart of DeWitt, Molly Schroeder, Dustin (Morgan) Schroeder and Brandy Schroeder all of Lincoln, and Kaden Schroeder and Nyah Schroeder of Raleigh, North Carolina; step sister, Julie Zwink of Seattle Washington sisters-in-law, Bernice (Buss) Ullman of Lincoln, and Lee Spilker of Pickrell; brother-in-law, Robert Weers of Diller; nieces, nephews and other family. He was preceded in death by his parents, granddaughter, Katie Sue Schroeder, step-mother, Bertha Schroeder, step-brothers, Marvin Spilker, and Dale (Mavis) Spilker; and brother-in-law, Robert Zwink. Funeral services will be held at 10:30 A.M. on Tuesday, November 27, 2018 at St. Paul’s (Soap Creek) Lutheran Church of rural DeWitt with Pastor Rick Johnson officiating. A family prayer service will be held at 10:15 A.M. Tuesday in the fellowship room at the church. Burial will be at St. Paul Church Cemetery. The body will lie in state at the Fox Funeral Home on Monday from 8:00 A.M. until 8:00 P.M. and at the church one hour prior to the service on Tuesday. The family will meet and greet friends and relatives on Monday from 6:00 P.M. to 7:30 P.M. at the Fox Funeral Home. A memorial has been established to St. Paul’s (Soap Creek) Lutheran Church with Kenny Holsing and Myron Helmke in charge. www.foxfuneralhome.net Arrangements entrusted to Fox Funeral Home of Beatrice. To send flowers or a remembrance gift to the family of Dale E. Schroeder, please visit our Tribute Store. "Email Address" would like to share the life celebration of Dale E. Schroeder. Click on the "link" to go to share a favorite memory or leave a condolence message for the family.